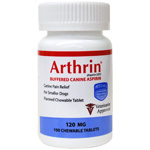 Arthrin Canine Aspirin are highly palatable, microencapsulated chewable tablets. Use for the temporary relief of pain, inflammation and fever. Artificial roast beef (soy base), Aspirin USP (acetylsalicylic acid), benzoic acid, citric acid magnesium stearate, natural liver flavors, silicon dioxide, sodium phosphate, sucrose. It is recommended that Arthrin Aspirin be given with food. Give 8-12 mg. per one pound of body weight every 12 hours (approximately one tablet per 8-12 lbs. of body weight every 12 hours). CAUTION: NOT FOR USE IN CATS. NOT FOR HUMAN USE. KEEP OUT OF REACH OF CHILDREN, PETS AND OTHER ANIMALS. If vomiting or diarrhea occurs, stop administration and consult your Veterinarian. If symptoms persist more than three days, discontinue use and contact your Veterinarian. In case of accidental overdose, contact a health professional immediately.